The eigenstructure method is based on the eigenvectors and eigenvalues of the covariance matrix as was introduced by Gersztenkorn and Marfurt (1999), though several details have been modified since then. The covariance matrix, is constructed from the analytic trace composed of the original data, and its Hilbert transform, along structural dip, to prevent ‘structural leakage’, corresponding to zero crossings (Chopra and Marfurt, 2007). The eigenstructure coherence described by Gersztenkorn and Marfurt (1999) was simply given as the ratio of the first (and by definition, the largest) eigenvalue to the trace of the matrix. The energy ratio coherence is thus a slightly more general computation in that it is taken as ratio of the energy of the weighted principal component filtered analytic traces, to the sum of the energy of the analytic traces or total energy. As semblance is the commonly available algorithms available in workstation software packages, we depict below the comparison between the semblance and energy-ratio coherence. Notice the sharp, crisp and more continuous definition of the lineaments seen on the energy-ratio display. 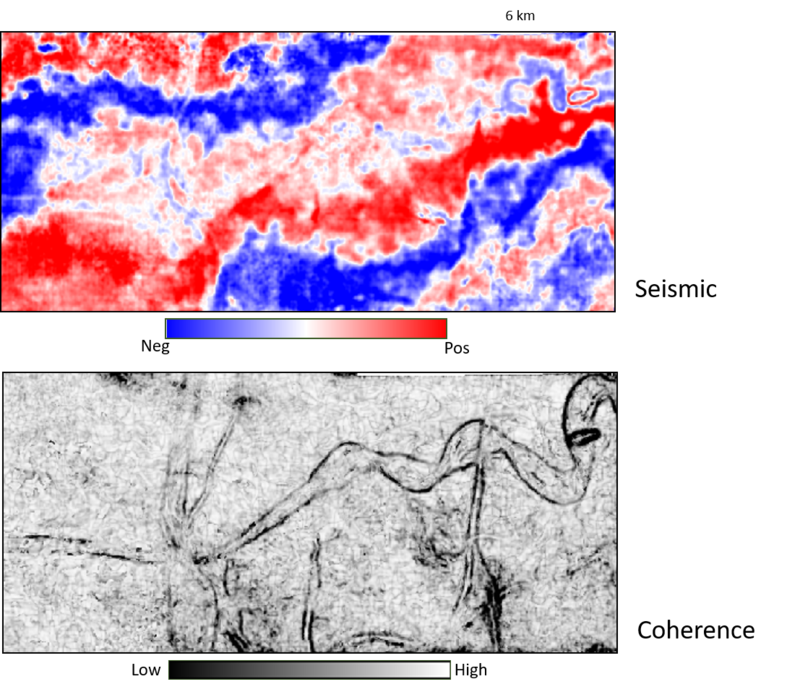 Comparison of stratal slice displays just above the Hunton Limestone marker through coherence volumes generated using (left) semblance, and (right) energy-ratio algorithms using analytic traces and the same 5-trace by 20-ms analysis window oriented along structural dip. Green arrows indicate zones of improved fault continuity using energy-ratio coherence. Red arrows indicate zones of greater noise in the semblance coherence. Overall, the energy-ratio coherence slices exhibit crisper, more detailed lineaments than the semblance coherence for this geologic formation. 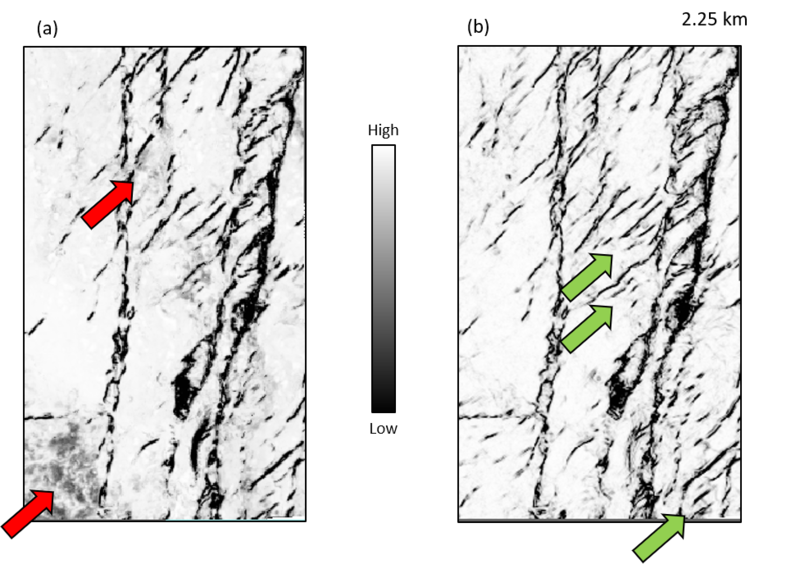 Equivalent horizon slices from (above) seismic, and (below) coherence volumes. The definition of different channels seen on the coherence display is difficult to detect on the seismic display.